As a result of the ballot for precedence on the Militia roll, the Louth Militia became one of the most senior units and was designated the 5th Battalion. Although it numbered only 6 companies it appears to have been described as a regiment rather than a battalion from its earliest days. However, the Louth absorbed the small Drogheda Battalion in 1800, thereby achieving regimental status. The Colonel of the Louth Regiment was John Foster, 1st Baron Oriel, and the last Speaker of the Irish House of Commons, while the Lieutenant Colonel was Lord Louth. Among the officers of the regiment was Sir Edward Bellew, a Catholic, whose son, Lord Bellew, was to be appointed Colonel of the Regiment in November 1843. The Catholic Relief Act of 1793 had removed most of the restrictions on Catholics in public life, including the ban on joining the Army. In spite of its small size the Louth Militia earned a good reputation for efficiency. When, in October 1798, General Lake ordered that a proportion of men in each regiment in his district ‘be immediately trained to act as light infantry, to practise firing at the target until they are perfect marksmen’, he set a goal for units to achieve. Thus in March 1799 the Louth Regiment was authorised to form ‘sharpshooters’, armed with ‘short muskets’, these being the 1768-pattern weapon which was being replaced in the Regular Army by the new 1793 pattern. Three sergeants and 64 soldiers of the Louths undertook training as sharpshooters. The threat of a French invasion at Bantry Bay in 1796 led to a deployment of additional Militia units to counter any landing. Among those so deployed was the Louth Regiment, which marched from its base in Limerick towards the area of threat, passing over mountainous terrain in cold December weather. However, the French fleet had been dispersed by storms and no invasion took place. Not until 1798 and the rebellion in Leinster did the Louths see action and then solely at Whiteheaps in Wicklow on 5 July. Only the Louth Regiment and the Leitrim Battalion were involved in this action. In the subsequent rebel guerrilla campaign in the Wicklow Mountains the Louth Regiment played a part in containing the actions of rebel groups. Exact dates for the embodiment of the Louth Militia between 1793 and 1816 are not known but would have covered the periods 1793 to 1802, 1802 to 1814 and 1815 to 1816. In common with the other Militia units the Louth Regiment was reduced to cadre strength in 1816. 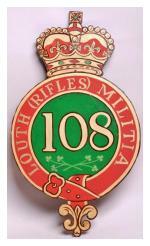 With the 1833 re-organisation of the Militia throughout the United Kingdom the unit became the 108th Louth Regiment and was redesignated the 108th Louth Rifles in 1855. On 1 February 1855 the Louths were embodied for the Crimean War. That embodiment ended on 1 July 1856 but was followed in October 1857 by embodiment for the Indian Mutiny until 31 July 1857. Lord Bellew, the Lord Lieutenant for County Louth, was appointed Colonel of the Regiment on 17 November 1843. In October 1847 Lord Massereene was appointed Lieutenant Colonel. Although the name Massereene is more commonly associated with Antrim, the family also had a home in County Louth, at Collon. Lord Massereene had a further family connection with the Regiment, being a descendant of its first Colonel, John Foster. Several of the officers of the Regiment in 1850 held commissions that had been granted during the early embodiments, Captain Latham Hamlon (1 February 1806) and Thomas Phipoe (20 June 1808) being the most senior. Ensign Tarquel Macneill and Surgeon Robert Pentland were the newest officers, both having been appointed on 2 February 1849. At that time the HQ of the regiment was at Dunleer. In 1881 the Louth Rifles became the 6th Battalion Royal Irish Rifles as the Childers Reforms were implemented. The Battalion held its annual training camps at Dundalk where a new rifle range was opened in the late 1890s. When, in February 1899, a new regulation for the Militia battalions decreed that brigade training camps be held a question was asked in the House of Commons about the War Office’s intentions. It was feared that all training for the Battalion was to be moved from Dundalk but an assurance was given that the Louth Militia would be trained at Dundalk at least one year in every three and in brigade camps, which it would not have been possible to hold at Dundalk, in the other years. On 6 December 1899 the Battalion was embodied for the Second South African War and remained so until 17 October 1900. This was the final embodiment for the Louths. In 1908, as part of the Haldane Reforms, the Irish Militia was redesignated the Special Reserve and a number of Militia battalions were disbanded, among them being the 6th Royal Irish Rifles.